From the famed Mayan ruin of Chichen Itza, to the beautiful waterfront of the Mayan Riviera, Mexico is chock full of beautiful destinations, quaint towns, historic churches and so much more. And let’s not forget their legendary food, music and festivals such as Dia de los Muertes! Travel to Mexico gives you the opportunity to explore amazing culture and incredible destinations. Explore the best of Mexico with Kids! 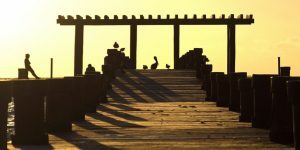 Check out some of our most popular Mexico blog posts. The Mayan Riviera is a stunning collection of ruins, beaches, and beautiful towns. Check out all of our favorite places in the Riviera Maya! The Mayan ruins of Chichen Itza are one of the new 7 Wonders of the World. But is it a great place to travel with a baby? 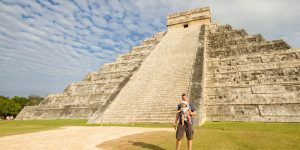 We lay down everything you need to know about exploring Chichen Itza with children. 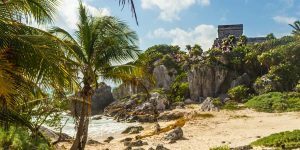 Is Tulum the Best Place for Family Travel in Mexico? Tulum lies just off the beaten path on the Atlantic Coast of Mexico. But this sleepy town hides one of the most unique Mayan ruins in Mexico. Discover why Tulum is one of our favorite Mexican destinations. There are many misconceptions about family travel to Mexico. Although many people worry that travel to Mexico is dangerous, it is actually on par with the United States in terms of safety. There are certainly areas of Mexico that are best avoided. And there are activities you should not partake in while in the country in order to maintain maximum security. But most areas of Mexico are very safe and incredible for family travel. Our family travel to Mexico guide will help you with what you need to know when traveling to Mexico with kids. Mexico uses the Mexican Peso. It averages about $0.058 USD. You can check the current rate of the Mexican Peso here. The Capital of Mexico is Mexico City. This sprawling city of over 10 million people is home to incredible ruins, such as Teotihuacan, amazing museums, restaurants and so much more. Power sockets in Mexico are of type A and B. The standard voltage is 127 V and the standard frequency is 60 Hz. Mexico has a wide network of cellular towers. Cellular access is available in most rural and urban areas. Driving in most areas of Mexico is safe. Be aware of pedestrians and avoid driving at night due to hard to see pedestrian and animal traffic. If driving a car across the border from the USA or Canada into Mexico, you MUST purchase a Mexican insurance policy. Most insurance policies will not cover a car from these countries being driven in Mexico. For more information about driving in Mexico read this. Most of Mexico is safe for families and children. Tourist areas especially are popular family travel destinations. Be aware if traveling near US/Mexico border areas as drug cartels may be operating in the vicinity. Check local and international safety news for details.